Intrigued by Sir Calogrenant's tales of an enchanted fountain in the Forests of Broceliande, Sir Yvain set out for Brittany and adventure. He quickly discovered the magic fountain and poured some water onto its stone surround. This alerted Esclados, the Lord of the Fountain, to his presence and he appeared in a mighty hail storm. The two fought and Esclados was eventually chased back to his stronghold, not far away. He died of his wounds while Yvain became trapped between the portcullises of his castle. A maidservant, Lunete, gave him a ring of invisibility which enabled him to escape. She presented him to the Lady Laudine - by then Esclados' widow - and Yvain immediately fell deeply in love with her. The fountain needed a protector, so Lunete persuaded the two to marry; and were happy together for a while. However, before long a band of Knights from the Round Table arrive and Yvain longs to return to Court. Laudine lets him go on the condition that he return within the year. Yvain, of course, soon lost track of time and, finding himself denounced by his wife, fled to the hills in a mad frenzy. He was eventually rescued and cured of his insanity by the servants of the Lady of Norison who administer one of Morgan Le Fay's magic potions. 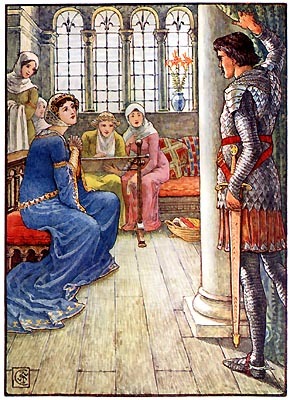 Yvain helped the lady beat off the attacks of Earl Alier on her land, before deciding to ask his wife to take him back. On the way home, he rescued a lion from combat with a serpent and the animal became his faithful friend, earning him the name of "Le Chevalier au Lion". Together they had a number of adventures: defeating a giant named Harpin, rescuing the maidens of the Castle de Pesme Aventure and settling a dispute between the daughters of the Lord of the Black Thorn. Eventually, back in Broceliande, Yvain rescued Lunete from imprisonment and was happily reunited with his wife. Sir Yvain returned to Britain to aid King Arthur during Sir Mordred's rebellion. He led a full battalion at the Battle of Camlann and killed several of the enemy's leading Saxon allies. He was killed by Mordred himself who cleft his skull in two! Sir Yvain is based on King Owein of North Rheged, the historical son & successor of King Urien, who lived in the late 6th century.